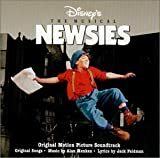 Accueil Bande originale Paroles Chansons Santa Fe – Paroles de la chanson dans “Newsies”. Santa Fe – Paroles de la chanson dans “Newsies”. So that’s what they call a family. Guess that everything you heard about is true. So you ain’t got any family. Well, who said you needed one ? Ain’t ya glad nobody’s waitin’ up for you ? I’m alone but I ain’t lonely. For a dreamer night’s the only time of day. When the city’s finally sleepin’. All my thoughts begin to stray. And I’m on the train that’s bound for Santa Fe. Like I’m gonna live forever. It’s a feeling time can never take away. All I need’s a few more dollars. And I’m outta here to stay. Where does it say you gotta live and die here ? Where does it say a guy can’t catch a break ? Why should you only take what you’re given ? Why should you spend your whole life livin’. Trapped where there ain’t no future. Breakin’ your back for someone else’s sake. If the life don’t seem to suit ya. How ’bout a change of scene ? Far from the lousy headlines. And the deadlines in between. Do you swear you won’t forget me ? If I found you would you let me come and stay ? I ain’t gettin’ any younger. And before my dyin’ day. Let ’em laugh in my face. Ain’t ya glad you ain’t that way ? Ain’t ya glad you got a dream called Santa Fe ? I can’t spend my whole life hidin’. You’re the only light that’s guidin’ me today. Will you keep a candle burnin’ ? Will you help me find my way ? You’re my chance to break free. And who knows when my next one will be ?